A couple of weeks ago, I got a call from Avis asking me to call them back and tell them the mileage on my Buick Rendevous. When I called them back and told them the mileage (about 3200 more than when I rented it), they asked me to come into the office. This was going to be a problem, since I am all the way across the country from the office. Fortunately, they said I could go to any Avis location and trade in the car. I was somewhat disconcerted, since the Rendevous was larger than the car I had reserved (a Pontiac Vibe). We worried about how to make sure I got an appropriate car from Avis. The worrying was all for naught, because the Avis representative said, "Would you like another Buick Rendevous?" The new car appeared identical, save for its California plates, low mileage and lack of a lingering cigarette smell. After looking at it for a while, we came to the conclusion that it might be a shade or two darker than the original, so we turned to photographic evidence. In the picture above, the original is on the right. It is, in fact, slightly lighter than the car I currently have. How boring is the Rendevous is those are considered two different colors to choose from? Or are those from two different model years? Well, I've been somewhat slack in posting lately. Here's a recap of what we did when we got back to La Jolla after visiting Dateland. We walked down to the shore, watching the sun set along the way. Then we settled down to wait for the La Jolla fireworks. We were a couple of miles north of the Cove, but this figured to be a good place to see the show when it started at 9. Around 8:30, fireworks started in a different location. We soon figured out that our vantage point along the shore enabled us to see a number of fireworks shows up and down the coast. That was pretty cool. The La Jolla show ended up being the most enjoyable, and proved a memorable close to the Fourth. 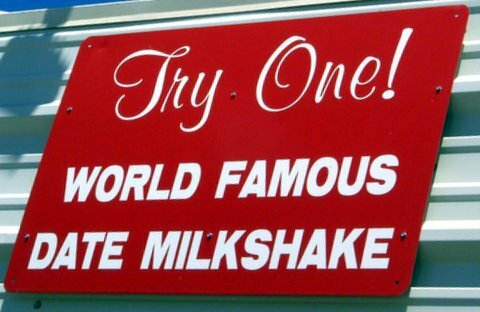 The first time I passed Dateland, Arizona, a couple of weeks ago, I resisted the sign advertising the "World Famous Date Shakes". The second time, last Friday, Christina and I did not feel compelled to stop. Yesterday, however, my resistance was broken down, and Christina and I stopped there for lunch. We got burgers, which were very good (though the gravy with which mine was soaked probably clogged my arteries then and there). 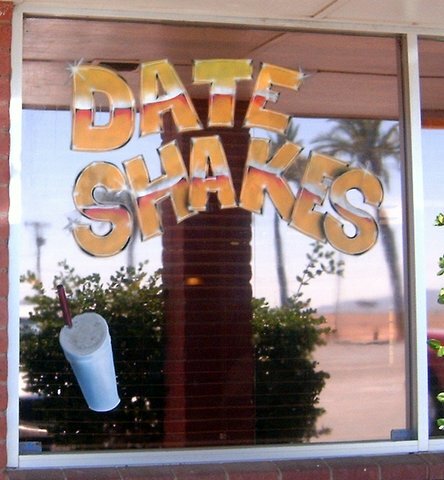 I had a date shake, which wasn't bad. Not great, not terrible. Christina tried a sip, though, and pronounced it awful. 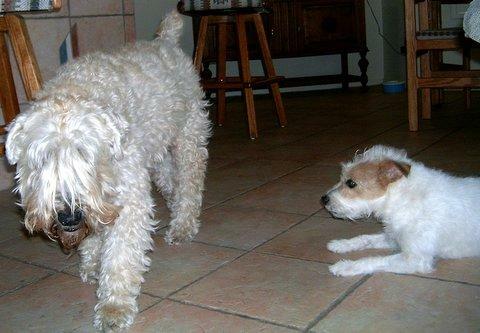 I took this picture to show Teddy's continuing social skills, but that was before he and Rudy got into a fight. At one point I grabbed Teddy and lifted him out of the fight, but Rudy continued to clamp down on Teddy's neck with his teeth for another minute or two. Teddy was fine, however.